● 68 x 34mm large LCD display. insulation(MΩ), continuity (Ω) and AC voltage. 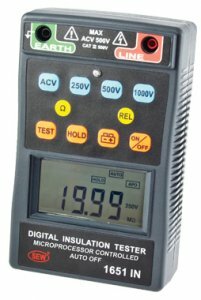 ● Three insulation test voltages(DC V) : 250V, 500V, 1000V. ● Auto data hold function. ● External AC voltage warning.